Description: Frankfurt. Detailed plan with a panoramic view of the city below. Red and yellow outlines indicate the extent of the city in the 9th century and the 14th century. Original colour. Description: Munich. Attractive city plan with illustrations of the important civic buildings below. Coloured. Description: Frankfurt. Attractive city plan with panoramic view below. German adaptation of the earlier SDUK plan. Coloured. Description: Hamburg. Detailed plan of the city noting major streets and buildings. Original colour. 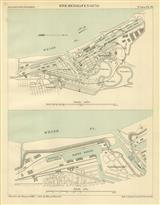 Description: Port of Hamburg, Detailed chart of the city detailing its docks. Printed colour. Description: Port of Hamburg, Detailed chart of the city. Printed colour.